Flutes are in the woodwind family, even though they don’t use wooden reeds. Instead, the sound is made from air passing over an open hole. The keys on a flute are similar to the keys on clarinets and saxophones by the way they are individually screwed to the instrument, and by the way the pads under the keys create a seal when they are pressed to change notes. 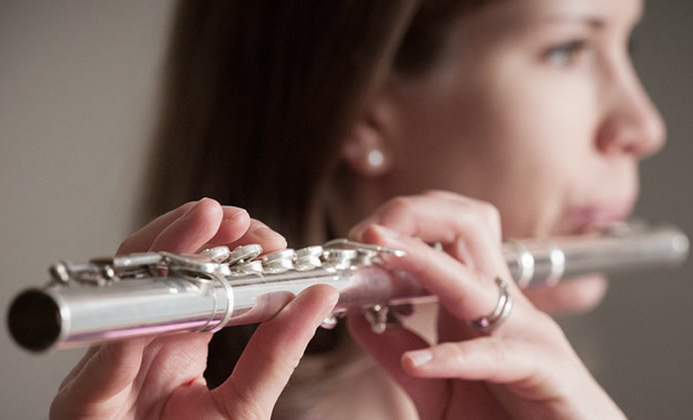 Flute lessons include learning to read music, sight reading pieces, using correct embouchure, improving playing techniques, and studying scales. Our private and small group instruction is taught by A+ music educators. They are professional educators who tailor each lesson differently so every one of our students' needs are met and their goal is to make you feel as comfortable as possible and have you playing on your very first lesson. As always, parents are welcome to attend lessons any time they like. Learning to play an instrument makes children well rounded and builds confidence in them and since children taught at our studio are required to create and follow a practice schedule, they are taught discipline and study skills that can be used in other areas of study. Learning the flute with help develop fine motor skills, aural skills, and logic and reasoning skills. Many different subjects are taught in music including math, history, and language; however, adults also benefit from music lessons. There is no set number that tells us when we stop learning. All of our lives we grow and mature and many adults find they are able to learn an instrument much quicker now than we could as a child. The flute is a highly versatile instrument with a strong footing in classical music that can be seen in both concert bands and orchestras. It is also very jazzy instrument and over time, many musicians have created fun and innovative sounds with the flute. It is an exciting and challenging instrument to learn, and great for seasoned musicians to pick up as a secondary instrument. The flute can be seen marching in military bands, in a formal concert hall, or in a more quiet setting like a coffee shop. Regardless of where it’s being played, the flute will always remain timeless.